I may not be one of those people that sails through autumn and winter without a lull in their mood but I do appreciate the excellent reading conditions that the seasons afford. I'm all for reasons to wrap myself up in my blanket burrito. Since I've spent the past week or so trying to determine what I want to read, I figured I'd procrastinate and share a selection of tips on how to organise your autumn and winter to be read pile. We all have a certain genre or series that we return to when we want to feel at 'home' and the colder months offer the perfect conditions for calling upon blankets and picking out something warming to read. Comfort reading can mean different things to different readers. For some, it might mean reading a book that fills them with nostalgia for bygone winters and for others it may mean re-reading the book with all of the pages that fall out because it has been read so many times. 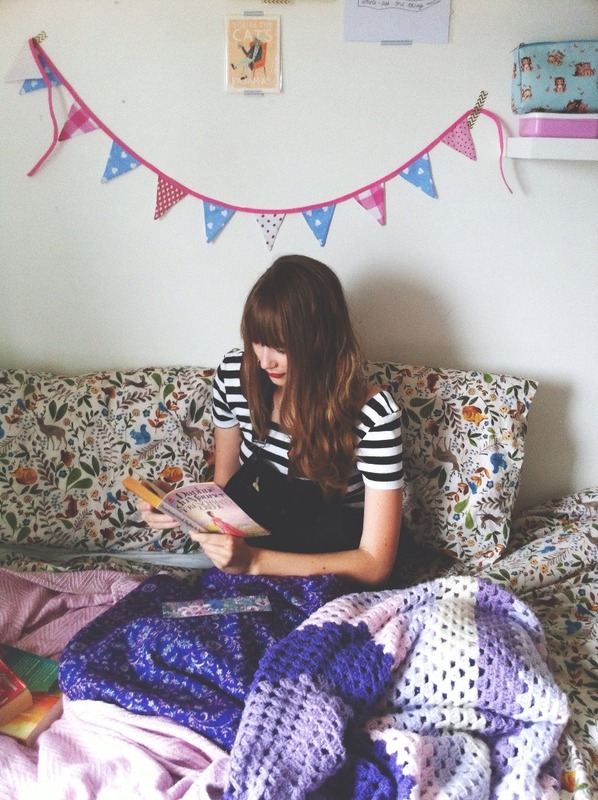 Find books that make you feel cosy and comfortable and keep them near. A lot of readers tend to put off lengthier books because they're a big commitment and nobody got time for that. However, life slows down ever so slightly during autumn and winter and it seems more acceptable to let your reading follow suit. Read a chapter or so per night and you'll soon work your way through them. Halloween is a big deal for some readers but spoopy reading can, again, come in many different guises. Round up your Agatha Christie's and the like for comforting teatime-telly murder mysteries or break the spine of your favourite contemporary 'reminiscent of Gone Girl' blurbed thriller and lose a few hours between the pages. Make sure you leave all the lights on if, like me, you get a little too involved. Treat yourself to a re-read of your favourite well-thumbed books. It's nearly Christmas, after all. There's something about the festive period, with the bustle of family members and mismatched seating, that makes me want to read the stories of other families from generation to generation. Find a book on your to be read pile that spans many decades, or takes place many years ago, and get immersed. For historical fiction, I recommend Tipping The Velvet by Sarah Waters. Classics thrive during the later months of the year! I'm talking lengthy Victorian novels that take ten pages to describe the buttons on the protagonist's jacket, slices of Gothic literature packed full of spirits and madwomen in the attic, and sprawling tales of smuggling on the moors. Classics, particularly the dark and looming ones, are the stodgy steamed pudding of literature and I love to indulge in them every now and then. During the second half of the year, I tend to get reflective and start thinking about my life and where it's headed. I then procrastinate. The best way to procrastinate from making actual big life decisions is to read about someone's else's life through a memoir or collection of personal essays! I'd highly recommend Patti Smith's memoir, Just Kids, for that sort of thing, or Olivia Laing's The Lonely City. Inspired by one of the prompts for Mercedes' autumn readathon, you could pick up a book set in a cold place. Be if fiction or non-fiction. There's no way you're going to want to read something set in a freezing cold cabin when you're sunning yourself in July so you may as well read it now. The autumn term has well and truly kicked in, for students and teachers, so what better way to celebrate than by reading a campus novel?! I haven't read many, granted, but the first one that comes to mind is The Secret History by Donna Tartt, which I read a few years back. Hope for the future?! Pfft, that's a thing of the past. Round up a selection of bleak dystopia and get ready for the year ahead. Make time for some good old science fiction, passages from post-apocalyptic hellscapes and worlds that actually don't feel too far off our very own right now. Happy holidays! So that's my advice on how to organise your autumn and winter to be read pile. I have a general how to organise your reading post if you're looking for more organisational tips too! God, I'm so helpful. If you're after some more book-related posts you can find a ton in my archives. I have never thought to match my reading to the time of year I am reading it, but will most likely do so in the future. Thanks for the tips! I'm currently making my way through Robert Webb's How Not To Be a Boy, amongst dozens of other books I've started and somehow got sidetracked from, and I can totally vouch for personal essays to be a top choice for the colder months. When I read someone else talking about their life, I start to feel nostalgic and cosy when I think about my own. I'm on a book buying ban at the moment, but I'm going to dig through the TBR pile to see if there's anything set in a chilly place next!